I am sending you warm New Year’s greetings from Asia and wish lots of happiness, love and health. At the end of last year, we commemorated the first anniversary of tsunami in South East Asia. I took part in the commemorative ceremonies that were organized in the South of Thailand. The situation in the South has improved since last year. However, the disaster can be still seen almost everywhere. 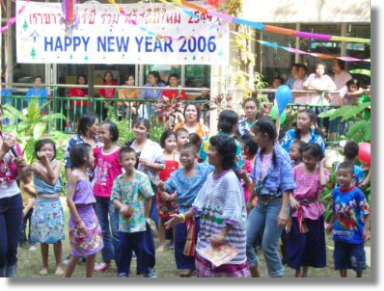 In this connection, I would like to convey to you the greetings from the people who take care of the children affected by tsunami, also of „our“ children in Satun province in school in Baan Boh-Chet-look. Mr. Tew Bunag, who is very actively involved helping personally to the children in the Southern Thailand (and whose brother is a member of Thai Royal Privy Council) in one of his lectures in Siam Society highlighted the work of Centipede and the presents from Centipede that Mrs. Bìla brought personally to the children in Satun. Centipede is recognized as an organization, which with its presents helped to psychologically devastated children to come back to ordinary life again. Even if the Centipede help is from the financial point of view a very small one comparing to other organizations and agencies, the children who received Centipede presents are very happy for them and did not forget Centipede even a year after. And you all are presented as a wonderful example of help that cannot be paid by money. Again, everybody can see that help from children to children, or from heart to heart, can overcome a huge distance. The respects and thanks belong to you and I am very honoured that it is me who is bringing you this message. On December 28, I also visited the children in Mercy Centre. 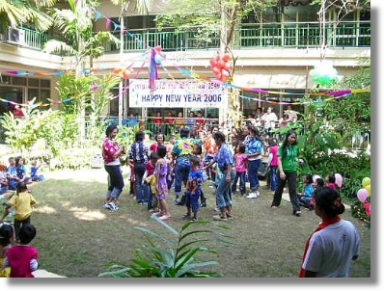 They celebrated the end of the year and welcomed the year 2006. I handed over the presents sent by the children of the school in Al, who sent paper origami. The children decorated their Christmas tree with them immediately. After that, they prepared a party with a very interesting and nice program. Apostolic Nuncios H.E. 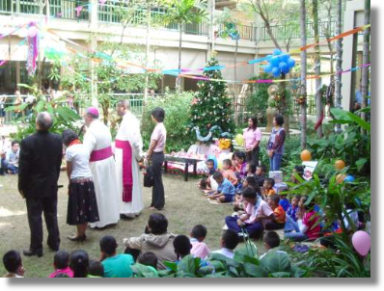 Archbishop Salvatore Pennacchio blessed the children as well. 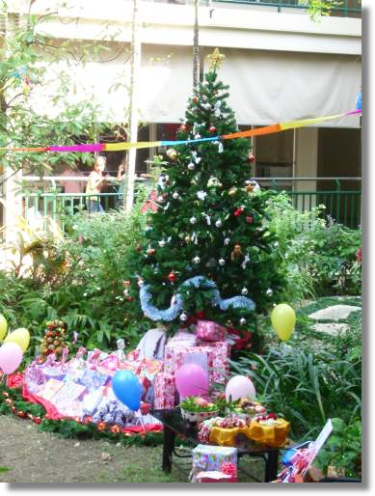 Part of the presents I sent also to the children in the House of Family in Phnom Penh, Cambodia. Everybody was very happy for the presents and memories and all of the children are sending warm thanks and greetings with the wishes for happy New Year. I am very happy that all of our children are all right, and that all of them entered new school term. I also wish to all of you a very happy new year and let us hope that the Centipede help will fly to as many children as possible and make them happy.